"No need to wait there, leave the door open and find a safe place nearby. Of course I mean a bar, Donna, yes. Goodbye." If you're afraid of ghosts, goblins and things that go bump in the night, then living in a haunted house isn't for you. Actually living in a haunted house isn't really for anybody, unless you're Cordelia Chase. Otherwise, you want someone capable of getting the spirits out of the house for a more satisfying living experience. Enter Frank and Sadie Doyle in Beyond Belief #1 from IDW Comics. The issue is written by Ben Acker and Ben Blacker, penciled by Phil Hester, inked by Eric Gapstur and Mark Stegbauer, colored by John Rauch and lettered by Marshall Dillon. It's time to send the little ones to dream land, and set your radio's dial to "SPOOKY." Meet Frank and Sadie Doyle, toast of the upper crust! Headliners on the society pages. And oh yes...THEY SEE GHOSTS! Who cares what evil lurks in the hearts of men...unless evil's carrying the martini tray! 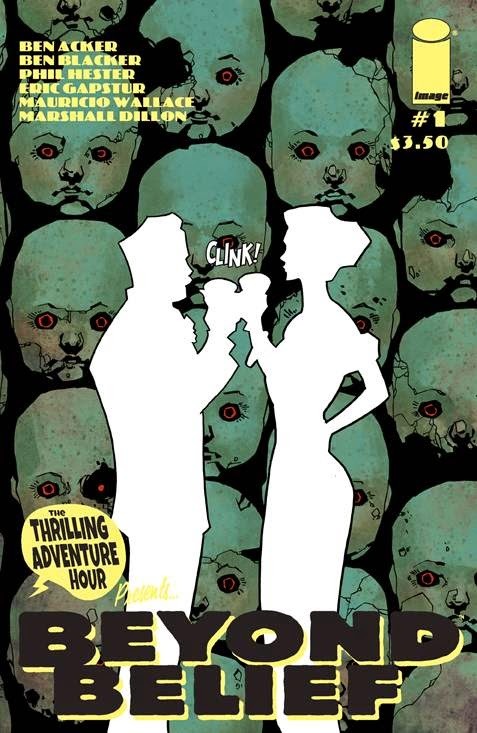 Beyond Belief #1 wears eccentricity on its sleeve like a point of pride. In Frank and Sadie Dyoel, Acker and Blacker have created a couple who are deeply in love with one another, trust each other implicitly and have a fun time hunting ghosts. Their exchanges throughout the issue are very rapid-fire and spirited (no pun intended), providing an approachability to the two as characters. The plot itself is relatively straightforward, but it's the characters that Acker and Blacker use to propel the story forward at a breakneck pace. And the issue opens and resolves itself quite elegantly when it's all said and done, bring the characters (and readers) full-circle and offering closure to the story. The illustrations in Beyond Belief #1 sport an older sensibility, thanks to Hester's great recognition of the nature of the story. The book isn't really meant to scare anyone per se and Hester's somewhat cartoonish approach ensures just that. There's a wide variety of panel layouts that keep the action fresh and engaging, accented by Hester's emphasis on character designs through well-defined angles. Gapstur and Stegbauer do a great job on the inks as well, ensuring the characters stand out amidst the backgrounds of doll walls and ghosts. Rauch's colors are darker where appropriate and the book feels awash in greens that evoke images of Slimer from Ghostbusters. Beyond Belief #1 is--quite frankly--a lot of fun. It's a series about a haunted house that never gets darker than that premise, eschewing the notion of a sadistic force from beyond terrorizing homeowners for a friendlier approach. Acker and Blacker's main characters are jovial and really good at their jobs, capable of mixing a fun give-and-take with resolving ghostly issues. Hester's illustrations are very clean and sharp, blending together the worlds of the living and dead in a way that's reflective of the atmosphere set by the plot. Beyond Belief #1 is a very enjoyable book that never takes itself too seriously, encouraging readers to simply sit back and enjoy the ride...martini optional. Beyond Belief #1 is in stores now.